This Laminated ITAR Sign Security Notice should be used on glass and windows ensure control of your restricted areas for compliance and to be used to give notice of restricted access to your facilities. Manufactured specially by CVG Strategy, our 3M customized 5×7″ “Laminated ITAR Sign” will last years and is suitable for indoor or outdoor applications. This is a small sign well suited to be placed on glass doors and windows on the inside. This Laminated ITAR Sign should be used to ensure Facility ITAR Compliance notice is made to all visitors upon entering a facility or department. Manufactured specially by CVG Strategy, our 3M customized 5×7″ white on red vinyl front adhesive Laminated ITAR Sign Security Notice will last years and is suitable for indoor or outdoor applications. Laminated ITAR Sign Security Notice is manufactured in white with a red background. Our Laminated ITAR Sign Security Notice has adhesive on the front for mounting on a glass door or window. The Laminated ITAR Sign Security Notice is chemical resistant, high temperature resistant up to 140F, and has an outdoor life expected at 5 years or more. 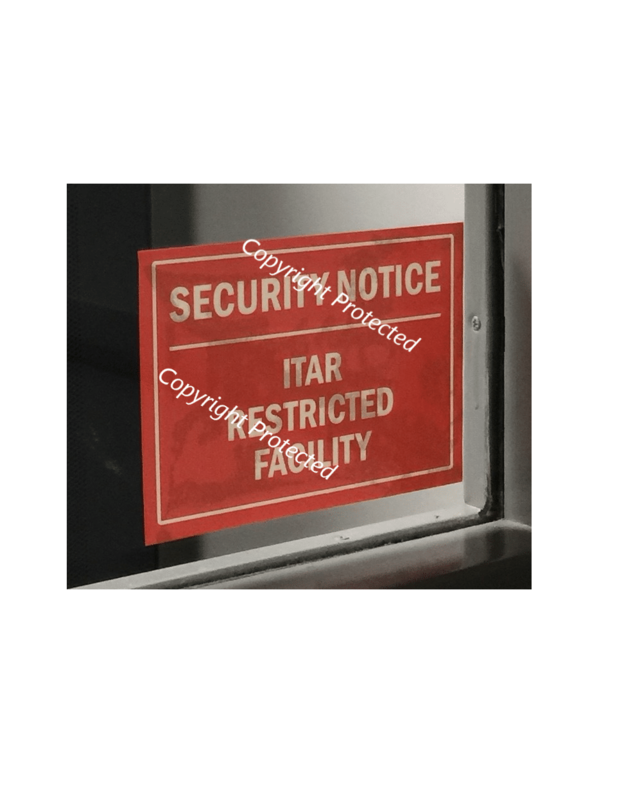 This Laminated is used at many commercial facilities in the United States and are very necessary to warn visitors that the company is committed to ITAR Compliance and in controlling access to its buildings and operations. It should be posted at all public entrances including buildings, gates and walkways directing visitors to go to the front office to sign in and be screened against Denied Parties and other U.S. Government Watch Lists. THIS LAMINATED ITAR SIGN AND NOTICE SHOULD BE POSTED ON ALL COMMERCIAL FACILITIES WHERE RESTRICTED ITAR OR EAR WORK IS BEING PERFORMED IN ACCORDANCE WITH US GOVERNMENT REGULATIONS PER THE DDTC.